This will be helpful to get specific output from AWS request command. There are two type of filters provided by AWS. 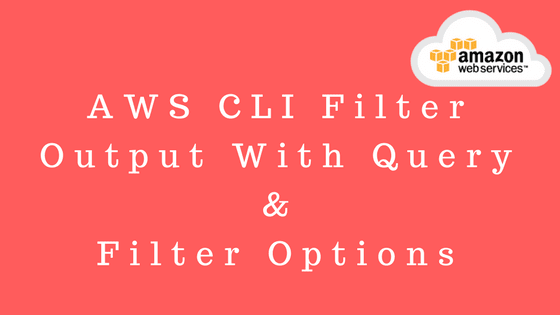 The server side filter is much faster than and efficient filter than client side (Query) but query option provides robust feature for most of commands supported by AWS CLI as compare to filter option. Note: AWS CLI is case sensitive framework. For example, If we want to see detail of any specific instance detail like t2.micro instance using filter option we can use command below to filter it out. As there are some limitations in AWS filter option that, it is generally supported by 'list' and 'describe' command and not for all AWS commands. In this case the 'Query' option can help us to filter out large amount of data. AWS Query command is different than Filter option command, it runs on client side. Please note here query expression is enclosed in single quotes but value for inside expression using 'backquote' character(`). The query written in this expression is in specific format following JEMSPath specification. It will show all the available regions supported by AWS, as of now AWS global infrastructure is spread across 16 AWS regions and in future it will increase across the world. You can see in query example command 'Regions [' is the parent field and [?RegionName is child field of region and value is 'us-west-2' which will be use for filter the output. The conclusion is Filter option is filter output on server side and hence it is more efficient however filter options has some limitations where as Query option supports universally by all CLI commands. Want to be AWS Certified Developer Associate? You should know this!